Few developers today remember the 70s. Nixon was president, the Apple II had just been released, Ethernet was just about to revolutionize local area networks, and VMS was a brand new operating system. This was when the major relational databases we know today were designed. It may come as a surprise to learn that despite decades of development, their fundamental architectures have not changed. They still bear the architectural baggage from those long ago times. These days, true innovation is coming from pioneers whose products were developed in this century for this century, taking advantage of the latest developments in microcomputer architectures. A new breed of of database is emerging. “Although the top 5 RDBMS vendors represent over 90 percent of the worldwide market, there is plenty of dynamism and growth potential in the remaining 10 percent, where differentiators that include low-cost, extraordinarily high throughput, embedability, and unusual architectures are aimed at niche data management requirements. These vendors certainly bear watching,”* said Carl Olofson, IDC Analyst. 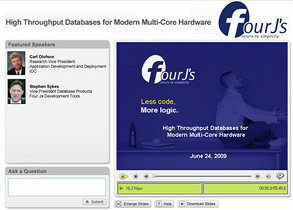 Today’s database leaders don’t truly benefit from the latest multi-core architectures. 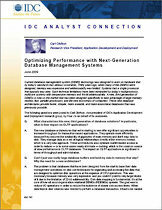 Join us in a fascinating webinar with special guest IDC’s Carl Olofson to understand why. He’ll discuss a radical lock-free architecture that allows databases to deliver significantly better throughput on modern multi-core machines. Mr. Olofson will be joined by Stephen Sykes, VP of Database Products at Four Js, who will discuss a practical implementation of this new approach with Genero db. * Taken from the IDC Competitive Analysis, “Worldwide Relational Database Management Systems 2007 Vendor Shares”, Carl Olofson, document number 212840, June 2008.